Rising healthcare costs have led insurers and employers to shift more financial burdens to patients through consumer-directed health plans that combine high-deductible policies with health savings accounts. These high-deductible health plans (HDHPs) have grown in popularity because they offer lower upfront costs and, theoretically, encourage patients to shop for better deals. Nearly 80 percent of health insurance policies bought through Affordable Care Act (ACA) exchanges are now HDHPs, as are more than a third of the plans offered by employers. However, studies led by Neeraj Sood, reveal that, while HDHPs may yield certain savings, pushing patients to have “skin in the game” can actually discourage them from seeking preventive care and buying drugs to properly manage their conditions. This, combined with the plans’ higher out-of-pocket-costs, may increase both the physical and financial risks to patients — especially those who are low-income or have chronic conditions. HDHPs offer low premiums in exchange for higher out-of-pocket payments before coverage takes effect. While previous studies have shown that consumer-directed health plans reduce costs, concern remains that enrollees do not distinguish between cutting down on low-value services, such as unnecessary emergency room visits, and utilizing high-value services, including preventive care. In one study, Sood and his fellow researchers examined how HDHP enrollees changed their use of pharmaceuticals for managing the chronic conditions of high cholesterol, hypertension and Type 2 diabetes. They compared companies that switched to consumer-directed plans with firms offering conventional coverage. 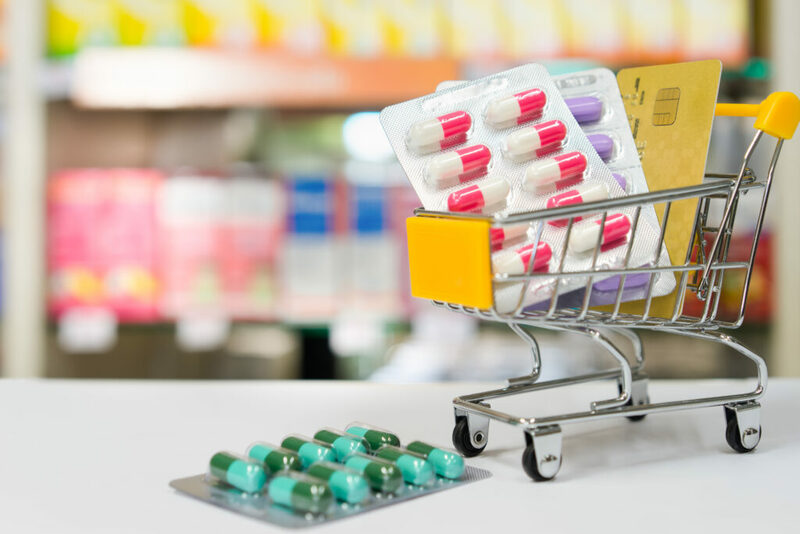 While certain employees with higher deductibles shifted to lower-cost drugs or changed the timing of their purchases, the biggest effect was to reduce utilization of necessary medicines. Some of this reduced usage may also come from fewer doctor visits for managing chronic conditions. The rapid growth of HDHPs has been at least partially driven by the belief that cost-sharing obligations will encourage health insurance enrollees to shop for healthcare as they would for any consumer item. Indeed, when surveyed, most HDHP enrollees — as well as most of those carrying conventional coverage — agree that out-of-pocket costs are important. However, in practice, few of the insured in either category shop around for care. When asked if they compared costs or considered other healthcare providers, only 4 percent of HDHP enrollees answered yes. Not only is that a tiny percentage, it also is just slightly more than the percent of respondents with conventional coverage who claimed they shopped around. In the long run, instead of saving money, HDHPs may be putting financial futures at risk by greatly increasing out-of-pocket healthcare costs for Americans who are low-income or chronically ill. Sood joined with Schaeffer Center researcher Erin Trish and Xinke Zhang, former Schaeffer research assistant and current manager of Global Health Economics at Amgen, in calculating the increased potential for financial trouble among consumers who switch from conventional to high-deductible coverage. They found that the likelihood was higher for all HDHP enrollees — and especially for those with lower incomes or who have a chronic illness. In fact, the higher out-of-pocket payments would leave more than half of low-income enrollees and over one-third of those with chronic conditions with excessive financial burdens. The percentage of those likely to spend more than $2,000 on care, for example, increased by nearly 10 percentage points. Meanwhile, the percentage of chronically ill patients paying that much on care grew by 15 percentage points. Sood and his fellow investigators conclude that consumer-directed health plans in their current form may represent too blunt an instrument to effectively curtail low-value healthcare spending. 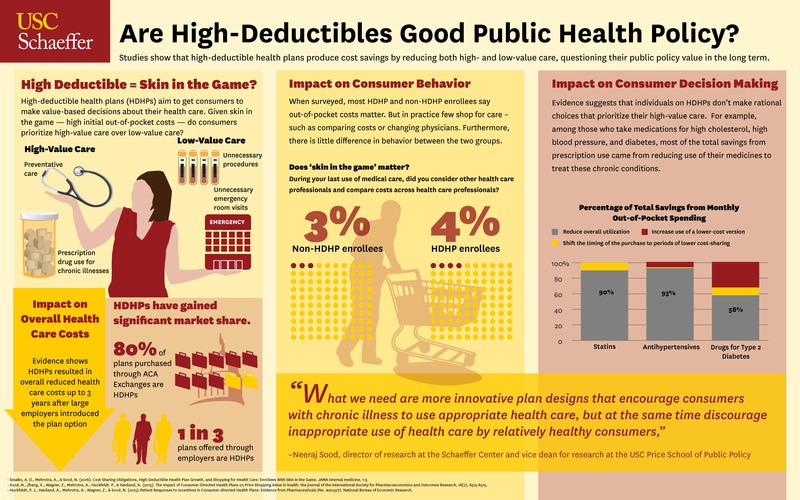 “What we need are more innovative plan designs that encourage consumers with chronic illness to use appropriate healthcare, but at the same time discourage inappropriate use of healthcare by relatively healthy consumers,” Sood says.